This 2-5 September, The Orchard Restaurant at Kantary Bay Hotel, Sriracha, invites you to come join us for a night of delicious Korean cuisine. Indulge in Korean Signature flavours with our chef’s selection of delectable dishes including meat and seafood barbecue, traditional vegetable and rice dishes, and traditional soups and noodles in our nightly dinner buffet. 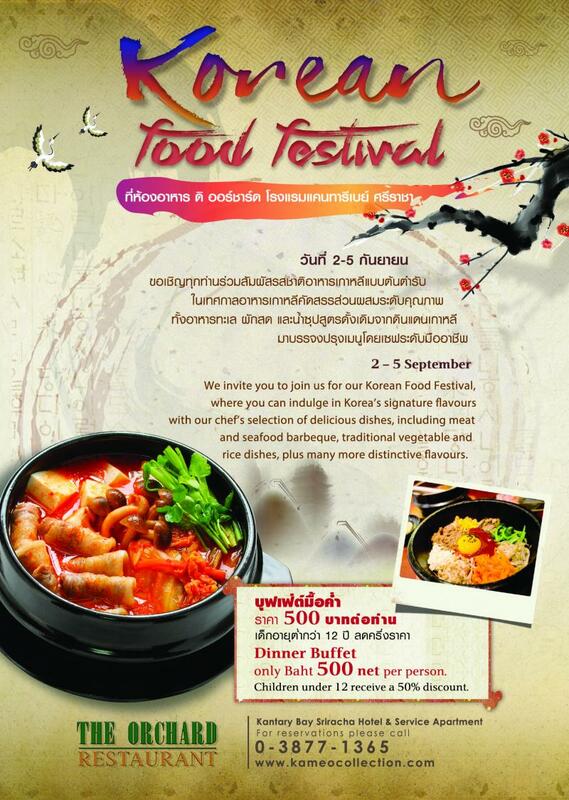 Enjoy this titillating culinary experience for only Baht 500 net per person. Children under 12 years old receive a 50% discount. For more information please contact Kantary Bay Hotel, Sriracha at tel: 038- 771-365 or visit our website at: www.kantarycollection.com. วันที่ 27 สิงหาคม 2558 เวลา 13:39 น.